In memory of Lily Anderson, an exemplary English teacher and Department Head for 25 years, who set high standards for students. Awarded to a graduating student achieving the highest mark in Grade 12 university-level English. Established by TH&VS graduate Shania Twain who, through hard work and perseverance, rose to become an accomplished singer/performer recognized world-wide for her talent and ability. Awarded to a graduating student from the First Nations Mattagami Reservation whose intentions are to pursue further education. The student must have demonstrated commitment, determination and a willingness to work hard and is expected to have goals and to be working hard towards them. Established by TH&VS graduate Shania Twain, who through hard work and perseverance, followed her dream and rose to become an accomplished singer/performer recognized world-wide for her talent and ability. Open to all students and awarded to a graduating student whose intentions are to pursue further education. The student must have demonstrated commitment, determination and a willingness to work hard and is expected to have goals and to be working hard towards them. In memory of Rita Seccombe who was an Art teacher at TH&VS from 1947 to 1972. An accomplished artist herself, many of Rita’s paintings hang in offices and homes throughout Timmins. Awarded to a graduating art student who will continue Art studies at the College of Art or at a university OR to a worthy student who wishes to take an Arts summer course or enroll in further studies in art. In memory of Gaston Melancon, a former member of the Timmins Lions Club, who demonstrated caring and compassion through extensive volunteer work in the community. Awarded to a graduating student demonstrating the same caring and compassion through volunteer work. Established by the May Family and awarded to a deserving graduating student. In memory of Ed Collins, a teacher in the Business & Commerce department for 22 years, who generously dedicated time after school to advise Students’ Council on monetary matters. Awarded to a graduating student entering a post-secondary Law and Justice program who has contributed to extracurricular activities and shown a strong work ethic. High marks are not the primary criteria. In memory of Sean Graf, a TH&VS student who died at a young age. He was the son of Hedy Baker-Graf and Frank Graf, both teachers at TH&VS. Awarded to a graduating student going to college to pursue the goal of working with children with disabilities. In memory of Frank Graf who was a long-time, knowledgeable and dedicated English teacher and Librarian at TH&VS. Awarded to a graduating student going to university to pursue a career in teaching. In memory of Bruno Toffanello, a long-time, caring and compassionate Auto Mechanics teacher and Technical Director at TH&VS who was well-respected by staff and students. Awarded to a graduating student in the Technical program who demonstrates an aptitude for auto mechanics, good character, satisfactory attendance and average grades. This student should also display perseverance & determination, respect for self and others and a sense of humor. In memory of Susan Hall, a talented music student at TH&VS who died at a young age. She demonstrated qualities such as gentleness, kindness and a genuine caring for others. Awarded to a graduating student pursuing a career in music. In 1980, on the occasion of the closing of the old TH&VS, Timmins High conducted a very successful reunion. At that time, a trust fund was established from the proceeds of the homecoming celebrations to fund scholarships for graduating students. Awarded to the top 2 graduating students who achieve the highest overall average. Awarded by the TH&VS Alumni Association to encourage and assist graduating students in post-secondary studies. #1 Awarded on the basis of a combination of good grades and contribution to the school. #2 Similar to #1 but without the grades component. In memory of Elisabeth Johnson who had a long musical career, performing until age 86 years at many charitable events and competitions in Northern Ontario. In November 2008, she was inducted into the Northern Ontario Country Music Hall of Fame. Awarded to a graduating student of good character who has made a commitment to music in the school or community. In memory of Ryan Reid, a young student at TH&VS who demonstrated courage and perseverance in his battle with cancer. He displayed a strong interest in auto mechanics and exhibited a positive attitude and a strong character. Awarded to a graduating student in the Technical program who has demonstrated an aptitude for auto mechanics, good character, satisfactory attendance, honesty, average grades, perseverance & determination, a sense of humor and who has respect for self and others. In memory of Lori-Ann Teixeira, a popular and athletic student who died unexpectedly at an early age. Awarded annually to a graduating student who best exemplifies Lori-Ann’s qualities of leadership, dedication to athletics, enthusiasm & school spirit. In memory of Helge Kleven who emigrated from Norway as a young man and studied to become qualified as an electrician. Awarded to 2 graduating students going into Electrical Engineering - one for a college-bound student and one for a university-bound student. Established by the Polish White Eagle Society to provide assistance to graduates of Polish descent. Awarded to a graduating student of Polish descent. Established by Hedy Baker-Graf, a teacher of French and Spanish, who actively assisted in students’ extra-curricular activities. Awarded to a graduating student pursuing post-secondary studies in teaching. In memory of Evelyn Rymer who was a well-respected business teacher and long-time Vice Principal of Timmins High. Awarded to a deserving student who strives to make a difference and demonstrates a strong moral character, respect for the environment, and an interest in women's rights just as Evelyn did. Established by the family in memory of Eric Peterson, a former TH&VS student who became a chartered accountant and who retired as Treasurer of the City of Timmins. Awarded to a student who has expressed interest in studying to achieve the Chartered Professional Accountant designation. 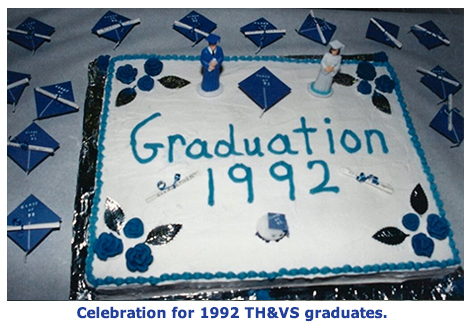 Donate to the THAA to help us continue to give scholarships to TH&VS graduates.